SUNDAY NIGHT ELECTRO FUN TIMES! 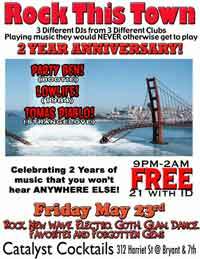 Featuring regulars MyKill & Forever21, plus me in electro/bmore/techno mode. DJS PLAY WHAT THEY CAN'T USUALLY PLAY! Featuring Tomas Diablo and Lowlife! 9pm-2am / 21+ / Free!! !